Next up is a 13.3" 535U3C ultrabook from Samsung - finished in silver, and offering an AMD A6 4455M 2.1GHz processor, 6GB of RAM, a 500GB hard drive all running on Windows 8. The most impressive aspect of this laptop is the overall size - 31.5cm by 21.9cm by an astounding 1.5cm - 1.7cm in depth, with an overall weight of just 1.52 Kg. This makes the 535U3C very portable and ideal for those that travel - read on for our Samsung 535U3C review. 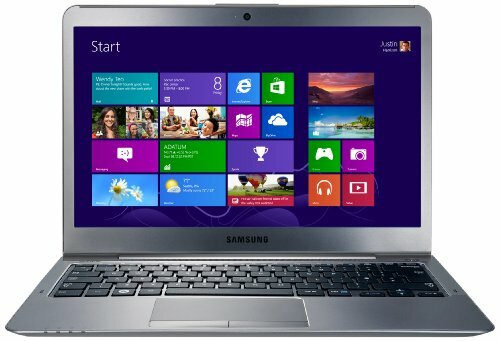 Below is our review of the Samsung 535U3C, a 13.3" laptop, featuring 6GB RAM, 500GB hard drive and Windows 8. Weighing just over 1.5kg, and offering plenty of power, the 535U3C ultrabook is on paper an ideal notebook for those who need a light laptop to travel with, whether that be abroad on flights or simply during the daily commute. At nearly half the weight of some laptops, this offering from Samsung will take up a lot less space and luggage allowance than the majority of notebooks, without much compromise in terms of computing power. Finished in a stunning silver casing, and with a remarkably low profile (1.7cm at it's thickest!) the 535U3C is sleek in appearance. Featuring the latest Windows 8 operating system, it boots up very fast, and ran well during our test. In terms of connectivity, which is usually where ultrabooks are lacking - a thin casing usually equals less room for ports - the 535U3C has multiple options: Ethernet, USB 3.0, HDMI, headphone/microphone combination, two USB 2.0 ports, a multi card reader and VGA (via an adaptor). As you'd expect, given the overall dimensions, there is no room for a DVD drive. The screen is a 13.3" model, and offers a decent picture - despite being slightly smaller than a typical 15.6" laptop, it still felt comfortable to work in front of. Overall colours were reproduced well, and the graphics appeared sharp and clear. The keyboard reaches across the width of the notebook's body, and as there is no room for a number pad, this leaves more room for the keys - which are nicely sized and evenly spaced to avoid typing errors. The touch pad - situated slightly left of centre - offered a decent level of control over the notebook, with the majority of testers finding it easy and accurate to use. In terms of processing power, this laptop features AMD's A6 4455M 2.1GHz processor - this unit is manufactured in 32nm SOI and provides a 2.1 GHz central processing unit (which can go up to 2.6 GHz with Turbo Core) together with a Radeon HD 7500G GPU together with a dual-channel memory controller. This is further backed up with a solid 6GB RAM, which kept Windows 8 running fast and without problems. Storage is provided with a 500GB SATA II hard drive - operating at 5400rpm, it offered plenty of storage without any issues during the test period. So who is the 535U3C aimed at? Incredibly light, small and powerful. If you prefer Intel based ultrabooks, then you may wish to purchase one of those instead of this AMD based laptop. Looks great, performs well and highly portable - what's not to like? If you're looking for a speedy laptop that isn't too bulky and ideal for traveling with, then the Samsung 535U3C may be the one for you.